Recently I sat down with a new client who is about to take up a leadership position and asked my normal first question “What will be the basis of the content you wish to discuss in our sessions? With unerring speed, he replied ” I am confused about the role of leadership in business” He went on to say he had been doing some background reading prior to our planned first meeting and had so many questions, his head was spinning. My initial approach to sessions mainly is focused on the person and getting a picture of his or her life before dealing with issues they have defined as important to them. The aim is to assess the person’s views on leadership. Walking away from that session I immediately began to investigate my own reactions posed by the young man, so much so it occupied my thoughts for a number of days afterwards. Trying to put myself in his shoes I imagined the number of texts and theories that are available, that would satisfy his questions. 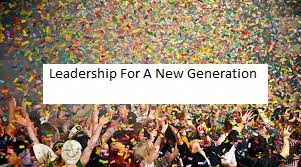 I came to the conclusion that if you filled leadership theories into a confetti box one could not capture every element as they fell to the ground. In the course of history, there have so many great examples of leadership in business. But really that does not explain why today we hear continually hear the plaintiff pleas from so many to “show leadership or the call for leadership”. Maybe we need to admit that some of the content is not totally appropriate for the current environment and aspiring business leaders. “Have we lost our way? Surely we are not encouraging our young people to accept the doctrines and some of the behaviours we have witnessed in recent times in terms of greed, respect and the almost total destruction of the principle of trust? I would hope we ourselves have learnt some valuable lessons to pass on to others. There can be no doubt our young leaders need to be equipped with a different set of tools to enable the successful management of businesses, they will encounter such as rapidly changing economic, political and social conditions. This will mean their general awareness levels must play a greater part in their knowledge and the ability to be agile when making decisions. So the key question is” What do I advise my mentee? Rather than roll out more theories perhaps it may be more beneficial to frame my responses by way of suggestions how he might handle certain situations. My personal opinion is that prescriptive advice is seeing its last days in terms of value and needs to be replaced with a more collaborative system which matches the thoughts and feelings of young leaders. Whilst change is necessary some elements will remain .Having awareness of the financial situation has to be a key component in leadership in any business, if the “numbers” get out of kilter you may not have a business to lead! Keeping track of how your business is performing is essential. Without a modern view of what people skills are needed, one cannot lead a business, the landscape is not only extremely competitive but also complex. This should not be confused with allowing a poor culture to develop under your leadership. Leadership is having belief in oneself and others with a particular emphasis on self-awareness). Do you have the ability, character to defend them when necessary? One of the main changes we have seen in recent years has been how we communicate in business both in terms of volume and quality. This had led to perhaps devaluation in the level of conversations within organisations diluting purpose and direction in favour of lesser important issues. Further education with workforces about issues that influence their work but just as important have an effect in their lives. Leadership can only achieve this by working, collaborating with an organisation’s people to find common purpose. My ongoing advice to my mentee or that matter to anyone else? You cannot pigeonhole how you display leadership, it is fluid, changing over time as the person gains lessons and experience from life. It will be reflective of you as a person, your values and beliefs and the how you face the challenges put before at a particular moment in time.